This is one of Filipino’s favorite afternoon snacks and is usually seen also with turon, maruya and other saba products. I’m really amazed at this food because you can make it a big business, people can eat this everyday and still love it. Well some make an alternate eating with different saba cooked snack like turon, maruya or some camote fries. It’s healthy, affordable and a good food opportunity business because you can buy saba bananas at P1.50 – P2.00 each and sell a stick of cooked banana for P10. It’s easy to cook this one, you just need a good amount of frying oil, bananas and brown sugar. 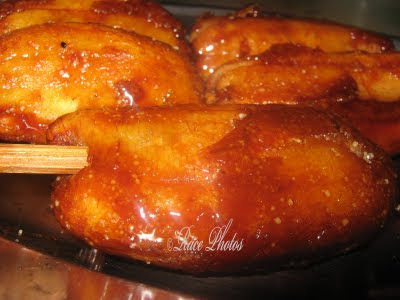 Bananas should be fried first before putting brown sugar on it and it should be deep fried. Then after straining all the oil from the cooked ones you will put two in one stick. Easy and from my calculations you’ll have approximately P3.00 profit from it. Well your profit will depend on how much cheap you can get your materials or raw foods. You can buy them in wholesale price for a much affordable cost.